This company is the best in the industry without a doubt. They have so much to offer plus all their products are reuasble and eco-friendly. Highly recommend these guys. Durable bag with a spacious amount of interior room. Great addition for my business. They really came in handy. Thanks a lot. These bags are very sturdy and durable. They carry way more weight than I expected. I will be repurchasing these bags without a doubt. 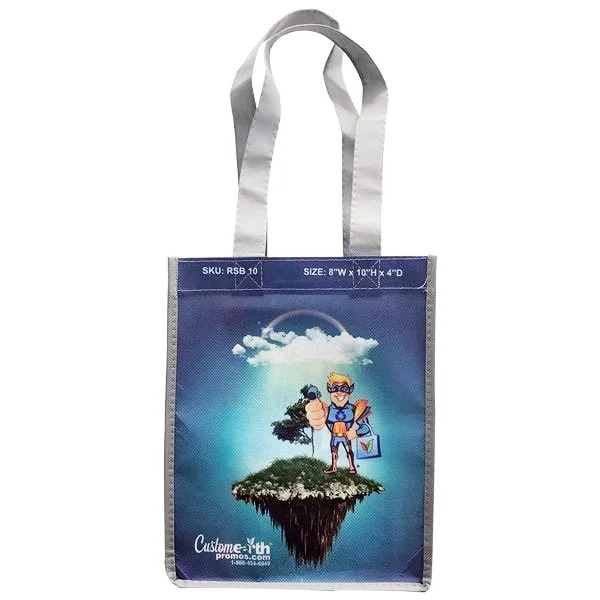 Eco-sublimated reusable grocery bags for a great bulk sale price. Gave these away at my annual convention and they worked just the way I'd hoped. Couldn't of done it without CEP's help. The logo you guys customized on these bags for us looks fabulous. Also, really like the handles on these eco-friendly sublimated reusable grocery bags. I am truly thankful for Custom Earth Promos. You are able to customize any item they have, including this one, just the way you'd like. My bags came out wonderful. Love these bags for my business. Had them customized with my companies logo directly on the center of this eco-friendly grocery bag. Thank you Custom Earth Promos. These reusable grocery bags were a perfect fit for my business. We added pockets inside the bags and it made them look even nicer. Thanks a lot. Need a unique customizing option for your business to promote with? 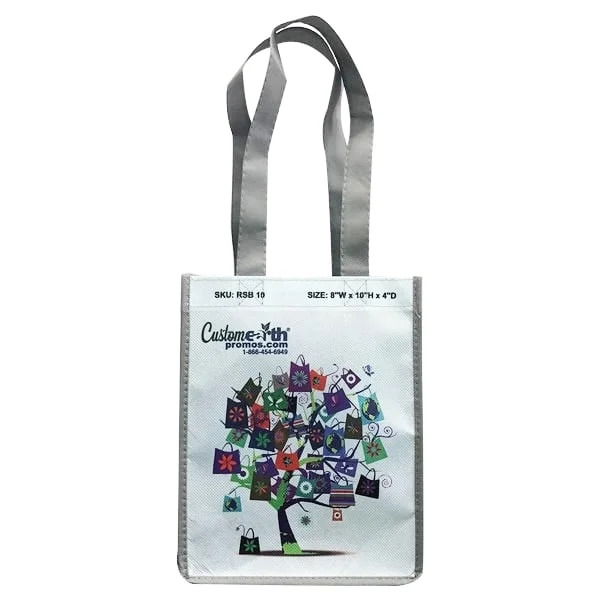 Use the new Eco-Sublimated Reusable Grocery Bag to print your logo and push your brand forward into the green market! Printing on the 12" W X 13" H imprint area is perfect for getting your message across in multiple settings! You can expose your brand at the grocery store, park, beach or errand. 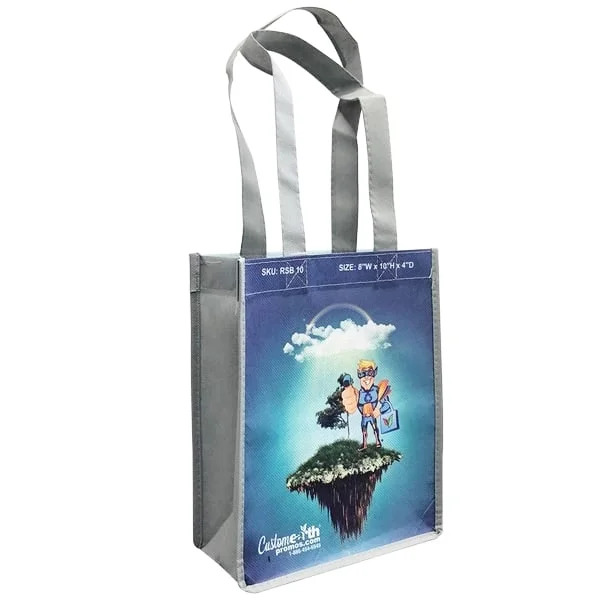 Our sublimated tote bags are reusable, durable and reliable, everything you want in a bag to reflect your business. Personalize to your liking with flexible options in bag size, handle size and stitching design. Original design ideas are welcomed with us; send in your ideas to work with our expert sales department and you’ll be sure to get the most from your experience! 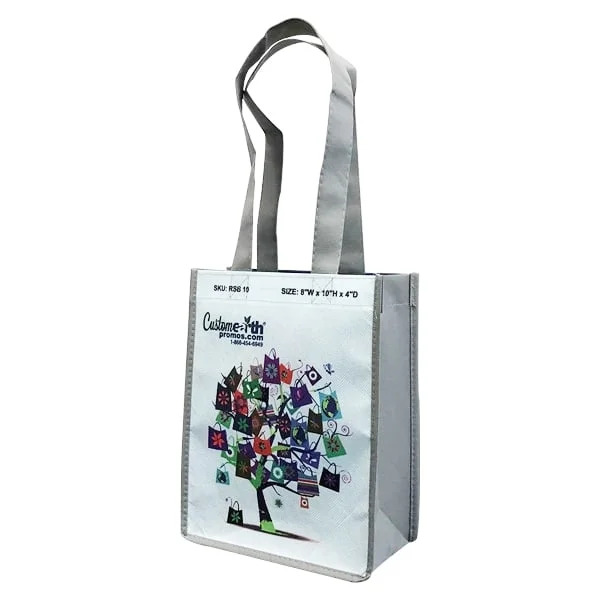 Fit everything you need in here with When it comes to making a statement for your company, make a statement that connects to your eco-marketing strategy! With a foldable and portable size, you will find that the bag is perfect for groceries, school or business! Easy to carry handles and design makes it a family friendly favorite product. Make the next trade show or convention center you go to an opportunity for your company shine to your clients! Imprinting your business brand on our recyclable totes bags means you get a personalized product for life! The options for customization give you the chance to carry whatever message you wish on the bags. Ask yourself “what do I want to portray for this company?” and use that answer to build a legendary promo product. You have our online virtual spec platform to customize to your content! Prove to your customers that your promo items are the best on the market, making your business the best in the market!